Doorgelicht, herstructureert en nu de toekomst in. a boost for French – Nigerian cultural diplomacy? The discussion was clustered into three segments except the appointment of a foreign affairs minister. These clusters are diplomacy, trade relations and cultural diplomacy. On the appointment of a foreign affairs minister, there are indications that apart from reducing Mr President’s workload when a minister is appointed, not much difference is expected in the foreign policy direction of the country. Indeed in some quarters, there is the reasoning that delaying appointment of ministers may be a strategy to initially define all policy directions so that when the ministers assume office, they would simply toe the established line. If so, it may not be entirely bad as long as it does not stifle the policy creativity of the ministers. Belgium became my adopted home over 20 years ago. Since the last 9 years when I went into party politics, I have maintained a routine of coming together with friends, Africans and Europeans, on the eve of the National Day, which is 21 July, for a drink and a chat. This routine has slowly graduated to a tradition. I’d normally use the occasion to feel the political pulse of friends and take home some useful hints. How we are faring in the local legislature was always the overarching questions for me as we converge? However the drink and chat this year was different for two reasons. One, our drink was preceded by what the organizers called ‘Wake-Keeping for Greece’. I was invited as Municipal Legislator to deliver a short speech at the gathering meant to show solidarity for Greece on its current economic tribulations. 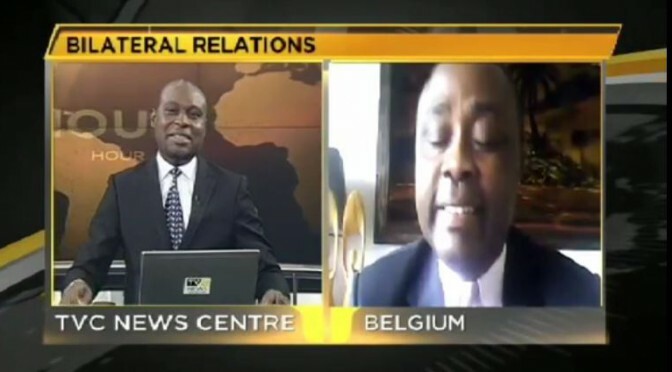 Two, ninety per cent of our conversation centered, not on Belgian national issues, but curiously on Nigeria, my country of birth. In specific terms we talked about ongoing State Visit of President Muhammadu Buhari to the United States, the same topic that had engaged me and a think-tank of Nigerians over the social media in the last week heightening a few hours before our drinks commenced. I thought it meant sense to send this postcard to Mr President and people of Nigeria to summarize the preoccupations of people out here about Nigeria. Nearly 48 hours into what is meant to be a 96 hour official visit by President Muhammadu Buhari, there has not been visible international media coverage of a trip sold to Nigerians as ‘historic’. It should have been historic because it is Mr President’s first major state visit since assuming office about 2 months ago. My folks here seem to believe that the visit is indeed historic but for the wrong reasons. A European student of contemporary African history and an avid watcher of Nigeria said he couldn’t immediately recall any previous first State Visit in recent history that appears to lack this much vision and focus. I was at a lost for a response when asked what the strategic intent of the visit was. What is historic about this State Visit? I attempted a response based on available media briefing from Mr President’s team and indeed in line with popular and reasonable expectations. The economy was meant as one of the major focus of this state visit. 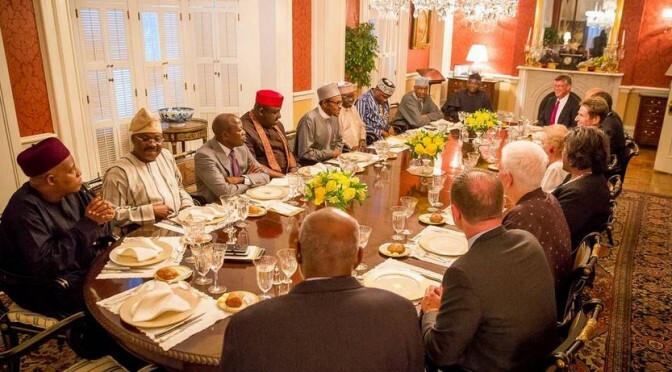 Indeed President Buhari is also expected to make public addresses at the U.S. Chamber of Commerce in Washington DC and at the Corporate Council on Africa to discuss international investment and Nigeria’s economy. The question that begs answer is how many members of the robust Nigerian Chambers of Commerce are in the delegation? Which business leaders of note are in the Presidential delegation? One is keen to know if Mr President shares the view that the most critical aspect of Nigeria’s economic concerns at present is economic diversification, away from the monolithic oil revenue. Which experts in economic diversification theory and professionals are in the delegation? On the political side of things, we were told by the media team of Mr President that U.S. Secretary of State, John Kerry, and the U.S. Congressional Committees on Foreign Relations will also receive President Buhari to discuss political ties between the United States and Nigeria. The Congressional Black Caucus in the U.S. House of Representatives will meet with members of Nigeria’s delegation as well. One astute Buhari supporter who jokingly said during the election campaign that Nigerians must vote anybody but Goodluck Jonathan felt strongly that it is only normal that for Nigeria to derive the best return on investment for this trip, members of Nigerian Legislature should have been part of the delegation even if there is a face-off between them and Mr President. If I ever get to see Mr President, he told me, I would probably ask him to consider sharing with me the rationale behind the exclusion of National Assembly (NASS) members in his delegation to the U.S. When asked, I had nothing to say except to deny that the President’s actions could have been dictated by bad blood between him, Senate President, House Speaker and other Legislators because of the way they ganged up against his party’s choices for the top positions in the NASS. Mr President, please tell me that I am right! Closely related is the concern that any deal reached by Mr President with both President Obama and the Congressional leadership would have to be ratified by the same Nigerian Legislators that have been excluded. Characteristic of these Belgian friends out here, is how they can put you on the spot with very uncomfortable questions. And directly too! This one got me struggling: could it be that considering the majority lead of the ruling All Progressives Congress (APC) in the upper and lower Houses, an easy ratification by the NASS of any agreement reached by Mr President during this visit with U.S. Congress may be expected? If so, shouldn’t we be concerned that our Legislators would be ratifying an Agreement on a position of weakness and lack of knowledge? How good is this in developing the legislative capacity of Nigerian Legislators? These guys could be polite as well because I believe the question they are not asking, out of politeness, I think is: for how long will Nigeria put up with Legislators who have no clue of what is going on at the floor of their legislative Chambers? Getting mildly irritated, I told my pals that I am conscious of the fact that this administration came into power on a promise of change. And for heaven’s sake, they have been in power for just 2 months and it’s unfair to expect magic as of yet. In a somber tone, the otherwise loud chap behind me in the bar, bent over, his neck slightly bent and almost whispering reminded me that Prime Minister Alexis Tsipras of Greece took only a week or so to constitute his cabinet. That aside, he asked if I was willing to swear on the head of my first son (he understood the place of first sons in my culture) that the few appointments so far made and the composition of the delegation to the U.S. were based on meritocracy? Do you now support political patronage, against the gospel you preach to us in the City Council because it’s about Nigeria, he asked, a bit agitated. I retorted that a selection based on who represents a better comparative advantage for the nation is my preference and I have no evidence that the President has done things differently here. I send this postcard conscious of the fact that Mr President has information that I am not privy to, which may have dictated his plans and actions but I felt a sense of responsibility, maybe obligation, to convey these raw thoughts considering that I am unable to reconcile a few available and obvious facts with the principles of good governance and strategic planning. It should be noted that friends of Nigeria, but particularly its critiques need to gain deeper understanding of the rationale behind the policy path Nigeria chooses to walk so that proffering constructive solutions for the plethora of issues retarding Nigeria’s national growth, could be made easier.